Hail Erik! How did you spend the summer? Did you visit some great concerts or festivals? - I spend the summer most of the time being busy at my job, but during my three weeks off, I went to Slovenia to a festival called Metaldays. Last year I've been there too when it was still called Metalcamp, and I already got my ticket for Metaldays next year. Unfortunately I didn't go to much festivals this summer, but maybe next year I'll visit a few more. Nevertheless, I always go to a lot of concerts throughout the year, and also this year I've been to some very interesting concerts. Please, tell us about all the important information about hard rock cover-band Plusminus, where you are also playing! - Plusminus is basically a hard rock cover-band, which performs songs from bands such as AC/DC, Thin Lizzy, Airbourne, Judas Priest, KISS, Rose Tattoo etc. We try to play the songs we perform quite close to the original version, and we also present the songs with an unpolished sound, the way hardrock was meant to be in my opinion. In the end the most important thing is, that we enjoy playing these great hardrock tunes. Our line-up is: Arie Kampman – Vocals, Peter Jung – Lead & Rhythm guitar, Erik Sprooten – Lead & Rhythm guitar, Alex Bakker – Bass guitar, Chiel Lozeman – Drums. The members of Plusminus are experienced musicians with roots in metal music. Besides myself, also Arie left some mark in the metal scene. 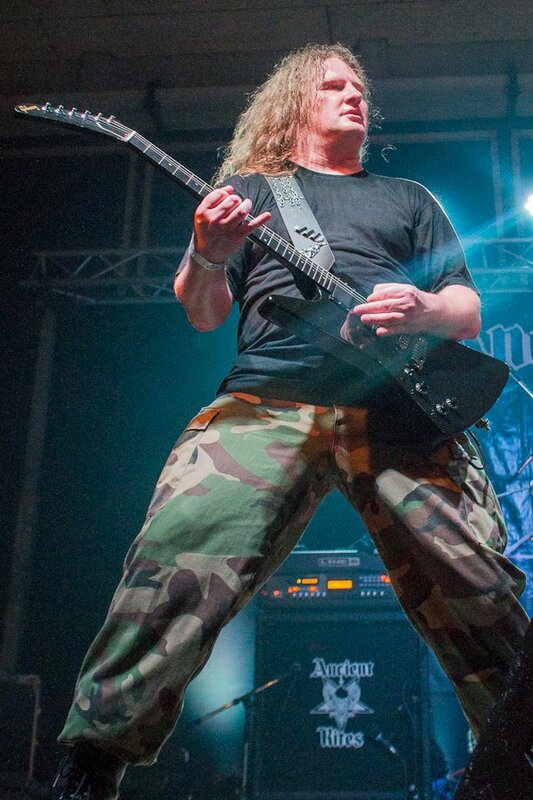 You can hear him grunt on the album “Embrace Damnation” of the dutch death metal band Houwitser. However, in Plusminus Arie doesn't grunt at all, but actually sings very versatile. Alex used to be bass-player in Inquisitor and can be heard on both demo's. Chiel used to play in a death metal band called Sublustris together with Arie. Peter did play metal for a short while, but he has developed himself as a (hard)rock & blues guitarist. Share please with the readers some details about foundation “Noord Geldersch Metaal”. 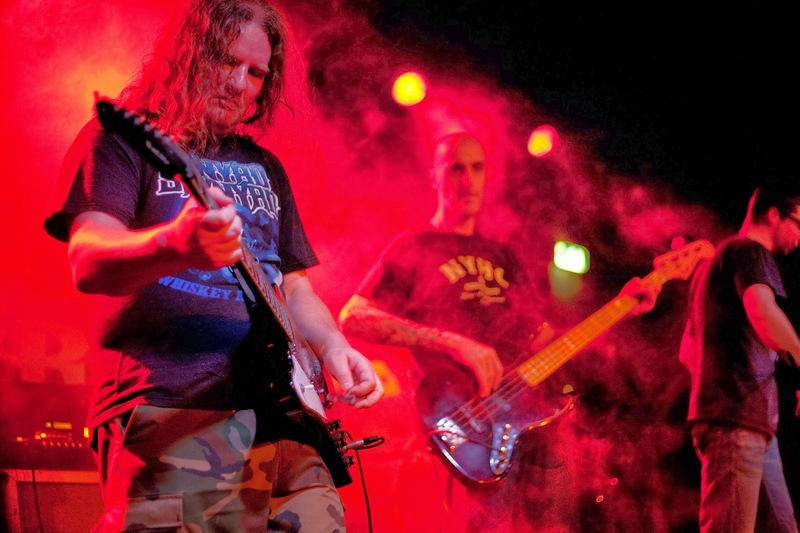 How popular metal music is in your hometown, Harderwijk? - Metal music still has a following in my area, but about ten years ago, there used to be a great rock/metal bar for a few years, and during those years, the popularity of metal over here was at its peak. After this bar closed, Noord Geldersch Metaal (NGM) was founded. The main goal of NGM is to promote and support our local metal scene and the metal scene in general. We used to organize gigs in very small clubs in our area. Up until a few years ago, we had to organize our 'bigger' metal gigs in a venue further away from our area but nowadays we mostly organize gigs (in two formats) in Harderwijk in a venue called Estrado. We do all styles of metal (and sometimes rock) and of course a lot of bands from our area and a lot of Dutch metal bands played at our metal events, but also foreign bands like Onslaught, Holy Moses, Freedom Call, Hysterica, Crematory, Sathanas, Nunslaughter etc. Before Ancient Rites you played in the legendary band Inquisitor, who released an LP in 1996 called "Walpurgis-Sabbath of Lust ". We heard you wanted to re-release it this year, will this happen? - The plan is, that the re-release of “Walpurgis – Sabbath of Lust” will happen next year via Hammerheart Records. The original release in 1996, was released on CD only. But the re-release will be available on CD and also on vinyl. Both demo's will also be part of the re-release too. And maybe some live footage will be added, but that depends on the quality. I was searching through my pile of underground fanzines with Inquisitor reviews and interviews I did, to see if there's interesting and/or useful stuff which can be used for the re-release. The search certainly brought back great memories. Who came up with the idea for the name? Were there other names before Inquisitor? - It was probably our bass-player (and founding member) Alex Bakker who came up with the name I think, 'cause he wrote most of the lyrics and probably stumbled across the word Inquisitor while reading about the Inquisition as inspiration for the lyrics. There was a temporary name before which I can't remember, but we used that temporary name for a few weeks/months until we finally called ourselves Inquisitor. What is your favourite Ancient Rites song and album and why? - First of all, I like all our, but some of them stand out a bit more. One of our songs which I like very much is Mother Europe, probably 'cause there are some of my best musical ideas in it, but it also is a song where everybody added great musical ideas to it, which makes this song a team effort, and this song has definitely become a favorite among the Ancient Rites Troopers. My favourite album? That's a difficult question, but I consider the album Rubicon probably as my favourite album mainly because I find the production and mix of that album much more optimal compared to the previous albums. What do You think about another bands of Gunther, as Iron Clad and Lion's Pride? As far as we know, you played guitar on 3 Iron Clad songs on the album "Lost in a Dream". Tell us more about this collaboration! - I like those bands but from a musical point of view I prefer Iron Clad more than Lion's Pride. Musically, Iron Clad feels much closer to my musical taste than Lion's Pride. I don't know exactly whose idea it was to ask me for doing some guitar solo’s on the Iron Clad album(s) and also on the “Stand and Defend” album of Lion's Pride, but I know that Gunther and Rony appreciate my way of playing guitar solo’s. In the end it was, logically, Gunther who asked me if I was interested in doing some guitar solo’s on an album for a project he was asked to collaborate, which later became the “Lost in a Dream” album of Iron Clad. The guitar solo’s were more or less recorded on the spot and mainly improvised. I haven't heard a single note of the music of Iron Clad before I entered the studio, so I didn't do any preparation to create some guitar solo’s or parts of them at home. Still the result satisfies me, and I'm glad that I'm able to improvise and create a guitar solo on the spot, if necessary. Even in live situations with Ancient Rites I do some improvisation on some of my guitar solo’s. What was your first guitar and what model(s) do you use nowadays? - My very first guitar was actually a right-handed Ibanez Roadster, which I restrung so I could play it left-handed. (For those who don't know or never did notice, I'm a left-handed guitarist). Basically this Ibanez guitar was some kind of a Fender Stratocaster copy with single coil pick-ups, but without a pick-guard. I don't have this guitar in my possession anymore, which I don't regret. My first left-handed guitar is my Ferrari Red LAG VRL, which is a Rhandy Rhoads Flying-V. Although this isn't a custom-made guitar, it still was made for me after I commissioned LAG (via a shop) to built their Randy Rhoads Flying-V model in a left-handed configuration. It took a few months to built but it was absolutely worth the wait. I still have this guitar to this day and I performed all gigs from Inquisitor with this guitar and (almost) every gig of Ancient Rites till just before the live-recordings of “And The Hordes Stood As One”. I still use this guitar from time to time, and this guitar is the one I consider as my real first guitar. My main guitars at the moment are Gibson Flying-V, Gibson Explorer and The Heritage H150 Black which is a Les Paul model. Your top 5 all-time favorite guitarists? I actually like a lot of guitarists, but the ones mentioned are the ones I admire most at this moment as individual players. Are you into in classical music? If yes, which compositors do you prefer? - I do like to listen to classical music but only from time to time. I can't really say that I prefer certain composers at this moment but I'm familiar with some music of Beethoven, Vivaldi, Schubert, Strauss, JS Bach and some others. There is definitely some great classical music recorded, which I should hear. I will definitely go to a classical concert in the near future. The closest thing to a classical concert I've been to was (The Original) Rock meets Classic earlier this year. The Netherlands and Belgium are both well-known about famous painters. Have you any favorite painters and paintings? Would you be so kind recommend us some museums? - We are definitely known for painters like Rembrandt, Rubens (Be), Vermeer but also Van Gogh. A well-known museum in The Netherlands is the Rijksmuseum in Amsterdam where a few paintings of Rembrandt, Rubens and Vermeer can be admired. And if you want to see some paintings of Van Gogh, you should go to the Kröller Müller Museum, which is not that far from where I live. I've been there once and there is quite a lot of modern art to be seen too. Some modern art I can appreciate but quite a lot of modern art I find extremely tasteless and a waste of money and materials. I appreciate our famous painters from the past most, but can't say that I prefer one. Dank je wel, Erik! The last words from Ancient hordes are yours! - Hail Georgius, thanks for this interview! World Wake Up! Keep supporting metal! 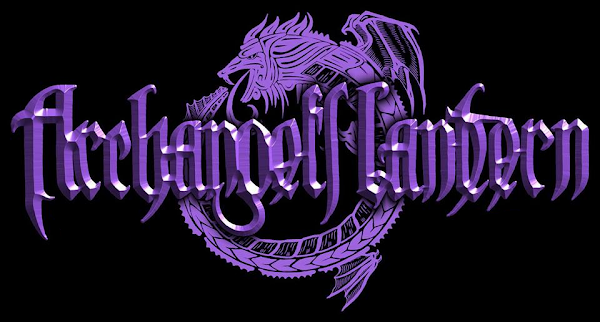 Hailz Erik, and hellcome to our webzine. Because this is the first intie with you, please give us some info about you! - Most people who read this interview probably know me best as Dutch guitarist of Black Metal band Ancient Rites, and some also might remember that I was guitarist of the Extreme Thrash Metal band Inquisitor. What is less known, is that I'm also guitarist for a Hardrock cover band called Plusminus. I'm also involved in a foundation called “Noord Geldersch Metaal” which organizes metal gigs in my hometown Harderwijk. During the daytime I have an office job at the planning department of a local company in my hometown. Tell us, first, how were you introduced into metal? - I slowly grew into listening metal, ever since I was exposed to KISS in 1979 when they had huge hits. Only after listening a lot to their compilation album “Double Platinum”, I started developing a taste for hard rock music. An older brother of a friend of mine introduced me to other hardrock bands like Van Halen and Status Quo. Only a few years later I discovered metal by checking out albums of Iron Maiden and Saxon. Around the year 1985, I started to appreciate Metallica and not much later also thrash metal like Slayer and Sacred Reich. At the end of the 80's, I started to appreciate death metal. And in the 90's I became interested in Black metal. Nowadays I still listen to a lot of metal but I also listen to what is nowadays called Classic Rock. Generally speaking, you could say that my collection of music ranges roughly from Southern Rock to Black Metal. Did you played in other bands before Inquisitor? - It's hardly worth mentioning but yes, I played in only one band before Inquisitor, which was called Menticide. Menticide was short-lived and never played live or released any demo. The very first line-up started in 1989 and was with Alex Bakker and Wim v/d Valk. For me and Wim it was actually our first experience of being in a band. Alex already had band experience before. Wim and Alex didn't stay long in Menticide and joined an extreme thrash metal band called Desultory. When Wim and Alex left Desultory in 1991, I joined forces with them again, and Inquisitor was born early 1992. My first live gig was with Inquisitor in 1992. What can you tell about the Inquisitor days? Are you satisfied now with its works? - Inquisitor existed roughly from early 1992 till the end of 1996 and was in a way a continuation of the extreme thrash metal style Desultory did, which was a style we liked a lot, but we felt that we could improve it to a higher level. Our main influences were (extreme) thrash metal bands such as Sadus, Kreator, Dark Angel and Sabbat but we were also influenced by death metal and other styles of metal. The first line-up recorded the demo's “Blasphemous Accusations” (1992) and “Your Pain will be Exquisite” (1993) and consisted of: Alex Wesdijk on vocals, Erik Sprooten on guitar, Alex Bakker on bass and Wim VanderValk on Drums. With this line-up we did several gigs in The Netherlands, and we even did three gigs in Belgium. At one of those gigs in Holland we were even support-act for a certain band called Ancient Rites. In 1993 some local churches searched contact with the organisation of an outdoor festival in our hometown to get our gig cancelled because they were very concerned with our “not so christian-friendly” lyrics. An article about this matter appeared in a local paper a few days after our gig, and the result of this was, that we gained even more attention in the metal scene. In 1995, the second line-up with Hans Pos on bass as replacement for Alex Bakker, recorded “Walpurgis – Sabbath of Lust”, which was released in 1996 by Shiver Records. With this line-up we did several gigs in Holland of course, and also three gigs in Germany. I'm still satisfied with the recordings and the music of Inquisitor. And I'm still proud of what I did with Inquisitor. I do enjoy reading reviews about Inquisitor on the internet. And without Inquisitor, I probably wouldn't be in Ancient Rites. I know that you re-released the LP "Walpurgis-Sabbath of Lust". Tell us more about this (the format CD/DVD/LP and if contains any additional stuff such as additional tracks or a booklet in it too)! - The original CD is hard to find for quite some time now, and last year I saw someone selling it on E-bay for a huge amount of money. Also last year, a friend of mine notified me about a split-CD with Inquisitor on it, which I didn't know existed. Apparently someone released this split-CD a few years ago, which wasn't an official release. So I guess if someone else is releasing Inquisitor non-officially, then it must be interesting enough to do a proper re-release. And it seems this is going to happen, 'cause at the moment I have a verbal agreement with a record company for a re-release. This re-release will probably contain the demo's too and may possibly also be released on vinyl. No release date is known yet. Are you still in contact with Inquisitor members? Have you ever thought of a reunion-show? - I'm still in contact with most Inquisitor members. Alex Bakker, the bass-player who can be heard on the Inquisitor demos, is also a member of my hard-rock cover-band Plusminus, so I see him quite often. I sometimes meet our ex-singer Alex Wesdijk. And recently I got into contact with Wim again. I met Hans, pure coincidentally, a few years ago on a small open air festival. Nowadays he plays bass-guitar in a band called “After The Silence”. What do you think about Centurian? What do you think about their latest album? - Centurian is one of the best and brutal death metal bands ever to emerge from The Netherlands, and was founded by ex-Inquisitor drummer Wim. Their music is quite intense. Once in a while I enjoy listening to their albums. And so far, I only have heard one song of their new album, which definitely sounds like Centurian, although it is without Wim on drums. Now about Ancient Rites: when and how did you joined? Was it during the supporting tour of "Blasfemia Eternal" or afterwards? 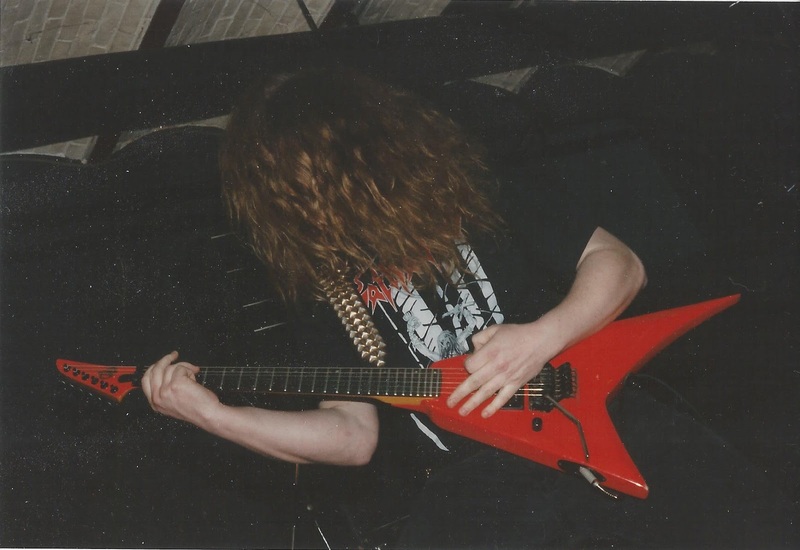 - During the “Blasfemia Eternal” tour in 1996, when I was still in Inquisitor, I was a session-guitarist, and I had a great time on that tour! It was definetely a tour with a good vibe between all the bands. That tour also helped Inquisitor getting some exposure in Germany. It was also during that tour, that Gunther and Walter already had plans to have two guitarists again in Ancient Rites. So when Inquisitor was struggling with internal problems later that year, the idea of me joining Ancient Rites as second guitarist was born. So I contacted Gunther and since someone else was also interested, an audition was organized. I was chosen, and became second guitarist of Ancient Rites, the first gig was in January 1997. The other guitarist back then was Raf Jansen. Later in 1997 Jan Yrlund replaced Raf. On the albums you played with Ancient Rites there was lot of melody. What were your influences on those albums? Are you interested into history too, like Gunther? - Throughout the years I've become a more melodic and versatile guitar-player, which especially culminated on the album “Rubicon”. Although a lot of melody is present on the albums I take part in, some of my thrash metal influenced riffs were also used in several songs. Fast melodic riffs like the ones which can be heard in “Mother Europe” and “Invictus” are definitely influences I brought into Ancient Rites. I also add my skills on guitar to the music of Ancient Rites but without comprising the music. On the “Rubicon” album there's for example one melodic/lead guitar which I play in the Harmonic minor scale (instead of the regular minor scale), which sound a little bit (so-called) Neo-classical, which I created just to make a little difference musically. Furthermore, I think that my guitar-solo's are an influence too. How was the Ancient Rites show in Rotterdam? Did it everything went well? What can you tell about the crowd? - I think we delivered a good show in Rotterdam.The reaction of the crowd was really good and quite a lot of them were banging and singing along. The sound on stage was good and really comfortable to play. Although I was a little bit struggling with my floorboard, I'm in general very satisfied with the gig. As I know You wanted to play live and in rehearsals a kvlt-track, Blasphemer from Sodom. Do You want to record then in studio also? - As far as I know, Ancient Rites has never performed songs from other bands live or in the studio, and probably never will. “Blasphemer” is definitely a kvlt track, and certainly one of my favourite songs from Sodom, but I don't have a real desire to perform or record this song with Ancient Rites. Last year during the rehearsals I sometimes just played the beginning of that kvlt song and Gunther simply reacted to that! It's something that just developed after Gunther and I listened to “In the Sign of Evil” from Sodom in my car after a rehearsal. How it's goings the things with Your guitar-parts for the upcoming Ancient Rites album? - At home I have recorded some guitar-parts and ideas, of which most of them I intent to use for Ancient Rites. Everyone is doing their share in writing new material and I'm working on a few demo-songs for Ancient Rites too, which are almost ready but I'm still not yet satisfied enough with them. It'll take me some time experimenting with ideas but in the end I will get a satisfying result. Most important thing is, that the music has to feel right. Some of my guitar parts will only take shape during the actual recordings of the upcoming album. Ancient Rites is definitely in writing-modus again and we already have written a few songs. Your top 10 all-time favourite metal albums are...? What are your hobbies besides the music? - In my free-time, everything I like doing is more or less music-related. But besides music, I like to take time to enjoy the beautiful nature in my area. There are plenty of beautiful forests and there is a lot of heath. Do you know any bands from Hungary, Ukraine, Romania and Moldova? - Not that much, but I know Sear Bliss and Negura Bunget, and thanks to you I know your old bands Castrum and Dohmring now. I also saw a few Romanian and Macedonian bands when Ancient Rites was on tour in the Balkan. 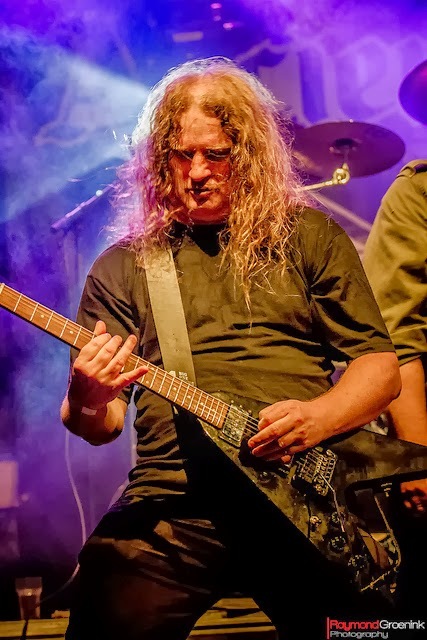 - In The Benelux we have known metal bands such as Heidevolk, Legion of the Damned, Aborted, Hail of Bullets, Asphyx, Epica etc..
From the lesser known bands I'd like to recommend Lord Volture, which is a great dutch Heavy/Power Metal band. For those who like Death Metal, I would recommend The Lucifer Principle, KhaoZ and Victimizer from The Netherlands. If you like hard rock, then I would recommend Vanderbuyst. From my own area I would like to recommend Thrash Metal band Portall. And last year I saw a promising heavy metal band from Sweden called Steelwing. Now about your local cuisine: what foods, drinks, cigars and tobaccoes can you recommend? - A typical dutch food is Kale aka borecole, although I wouldn't consider this as Haute Cuisine, it does taste good in my opnion. It is mostly served in combination with a smoked sausage known as Gelderse Rookworst., which is a speciality from the province Gelderland where I live. When it comes to dutch beer, I would recommend Hertog Jan. A typical Dutch drink is a spirit called Jenever, which seems to be comparable to Gin. I don't smoke at all, so I can't and won't recommend cigars and other tobacco related stuff at all. Dank je wel, Erik! The last (hateful) words are yours!